Pentax teasing major launch for June 1? New 645D? Just a Spanish promotion? Is Pentax releasing another camera model this week? A teaser has appeared on Pentax Spain's Facebook page which suggests that something new is coming on June 1 - but what could it be? 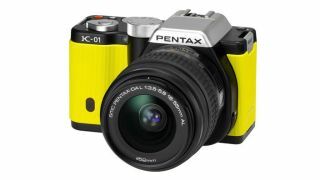 Pentax only announced its latest new DSLR last week. The K-30 features a 16.2 million pixel sensor, weather proofing, in-built art filters and leveling sensor. However, possible suggestions for what could be unveiled on Friday range from a new medium format camera to sit alongside, or replace, the 645D to a new, cheaper mirrorless camera in the K-01 range. Or, of course, it could just be that Spanish customers will be treated to some sort of special offer come Friday. A number of suggestions and rumours about what Pentax could offer have emerged in the past few months, several of which have not yet come to fruition. This includes the idea that Pentax would unveil a full-frame mirrorless camera. Pentax was bought out by Ricoh in a deal last year, while cameras produced in collaboration between the pair have been thin on the ground. The last mirrorless offering from Pentax, the K-01, was designed by Marc Newson and had been in development since before the merger took place. Keep following for more updates as they happen.